Since when the double-decker buses plied in the city? The Statesman informs us that the British brought them to Kolkata way back in 1926. 83 years have passed since. Many Kolkattans will have nostalgic memories about riding in these buses. And now the double-deckers can be seen on city roads for 2 more days in keeping with High Court’s order to not ply 15-year old commercial vehicles from August 1. Does this mean double-decker buses have no future in the city? Not necessarily because they do ply in many cities of the world. Those that ply in various Japanese cities are nicely designed – both exterior and interior – unlike the rickety conditions of Kolkata double-deckers. 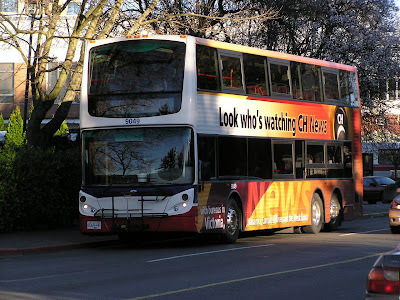 Here is the picture of a double-decker that runs in Victoria, British Columbia, Canada from 2000 for the public transit system.